Mocktails + Mastery is a recipe book of non-alcoholic drinks. It is not, however, your standard recipe book. The book challenges Australian drinking culture and encourages the use of non-alcoholic beverages when celebrating, so that everyone can be included. It aims to prevent harms from alcohol by giving readers the information and tools they need to make informed choices, and by presenting the reader with practical tools for feeling good and building up the protective factors in their lives. Mocktails + Mastery is available to download and read on all devices. Printed copies of Mocktails + Mastery are coming soon! Reserve your copy or enjoy the digital versions via our Resources page. Click here to visit our Resources page and read Mocktails + Mastery or learn how to request a hard copy. This resource was imagined in 2015, and has been a steady work in progress ever since. The author, determined to create an accessible resource for everyone to enjoy, picked up the project after noticing the different atmosphere at an event where mocktails were not only available but happily encouraged. 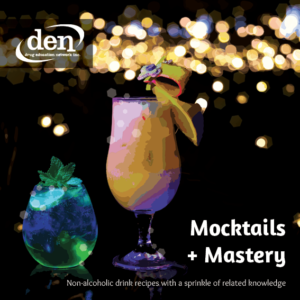 The book was initially intended to be a small collection of recipes, to be offered at education and training events on topics such as safe partying, as mocktails have been a popular part of many DEN sessions over the years. In 2016 the project began in earnest, with thorough research into the effects of alcohol and alcohol expectancy, the evolutionary biology of motivation and pleasure seeking, and most importantly how people can achieve the goals of relaxation, fun and pleasure without using alcohol. Mocktails + Mastery is a resource to provide tools to allow people to make their own choices around alcohol, and to encourage positive and healthy behaviours.